Chicco Charlie Sky Rider Ride on / Walker. Chicco baby walker. Used condition bit of wear on seat but all working, music/light tray removable, collapse's as well. Collection from Cranbrook, Exeter. Cash on collection accepted Bidding to buy not view. Chicco baby walker with one ball. In great condition. 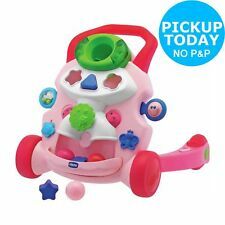 Musical Baby Walker & Shape Sorter. Walker makes animal’s sounds / different musical songs / phone-call sound as press or turn the buttons on. Very good and clean used condition. It’s in good working order except lost one ball shape block,sell as picture shows. From a smoke and pet free home. Car Baby Walker great to give your baby freedom in side and keep them safe outside. Condition is Used from a smoke free and pet free home. Collapses flat. baby walker chicco. Condition is Used. Collection in person only. • 4 in 1 activity centre. Chicco Baby Walker Yello all there good condition and working apart from clip on toy which sits on top, my daughter liked to have her cup on there, we never used it and its now missing. Good used workingcondition and clean just a few scratches on the bottom from bumping in to things as expected. 1-2-3 chicco baby walker. Used, Collection only. Condition is Used. Collection in person only. baby walker chicco used. Condition is Used. Collection in person only. This walker has never been used due to the fact that my baby didn't even want to give it a try. As it can be seen on the pictures it doesn't come with the playboard because it was used by my baby. The only thing it needs is a little bit of cleaning because it has been moved around from one place to another. If you have any questions please do not hesitate to ask. CHICCO GIRELLO DJ BABY WALKER REMOVABLE COT PLAY TRAY IMMACULATE !! THIS BABY WALKER SHOULD ONLY BE USED BY BABIES THAT CAN SIT UP UNAIDED (approx 6 months old) IT IS NOT SUITABLE FOR BABIES THAT ARE ABLE TO WALK OR THAT WEIGH OVER 12 KG. Folds flat for easy storage and travel. chicco baby walker. Used but great condition. A few dents and scratches but otherwise perfectly good condition. Clean and still works great. Adjustable heights and folds flat. Current batteries still work. Kirkby in Ashfield, Nottingham. Collection only. Chicco Baby Walker 1 2 3 green. Condition is Used. Collection in person only. The activity centre on the front of the walker is great for sitting to play as little ones put the balls and shapes through the holes for more music, lights and sound effects. Baby walker features To be used under the direct supervision of an adult. baby walker used. Condition is Used. Dispatched with eBay delivery – Shutl 2-3 days. 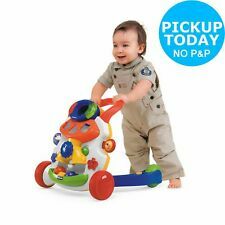 CHICCO GIRELLO DJ BABY WALKER REMOVABLE PLAY TRAY IMMACULATE !! CHICCO GIRELLO DJ BABY WALKER REMOVABLE PLAY TRAY IMMACULATE !!. Condition is Used. Collection in person only.